In their complaint to the state’s Supreme Judicial Court, the groups say the ballot measure sponsored by a coalition of labor unions and left-leaning activists is unconstitutional. The proposal, known as the Fair Share Amendment, would put a 4 percent surtax on annual income over $1 million and earmark the additional revenue for transportation and education. Eileen McAnneny, president of the Massachusetts Taxpayers Foundation, said the ballot initiative, which would amend the state constitution, is a bad idea.
" The mission of the Mass Taxpayers Foundation is to promote the long term economic well-being of the Commonwealth, and we feel this ballot initiative has negative long term implications for the way we budget, so we challenged whether or not it is valid," McAnneny explained. Joining McAnneny as plaintiffs in the suit are representatives from the Massachusetts High Technology Council, the National Federation of Independent Business, Associated Industries of Massachusetts, and the Massachusetts Competitive Partnership.
" The legal challenge is about our legal concerns. So, putting aside the economic and fiscal concerns aside for the moment we believe there are three reasons why it should not go before voters next year," said McAnneny. The groups argue the ballot question improperly involves unrelated topics, violates the state constitution’s prohibition on using the initiative petition process to make specific appropriations, and would take fiscal policy away from the legislature, according to McAnneny. "If this ballot question is allowed to go forward, voters would have the power to both raise revenue and appropriate it and that is a power that right now resides solely with the legislature," said McAnneny. " That, in our mind, has huge implications." The defendants in the lawsuit are Attorney General Maura Healey, whose office certified the ballot question, and Secretary of State William Galvin, whose office is responsible for putting the measure on the 2018 ballot. 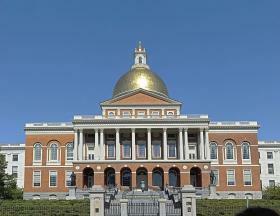 The Raise Up Massachusetts coalition is behind the ballot measure. In 2015, the activists launched the process to amend the state’s constitution by collecting over 157,000 signatures. Votes by the state legislature in 2016 and 2017 advanced the initiative proposal to the 2018 ballot. Coalition spokesman Steve Crawford said the legal challenge from the business groups did not come as a surprise.
" Their argument that education and transportation are not related seems odd because it is an argument the business community itself has made for decades: that a sound education system and a good transportation system that gets people to work and goods to market are essential for Massachusetts," said Crawford. Crawford said the coalition is confident the proposed initiative will withstand the legal challenge. "There is precedent on our side and history on our side. We already dedicate funds in the constitution now through the gas tax," Crawford said. " I am not a lawyer, but their arguments seem a bit thin to me." The state’s highest court is expected to hear oral arguments in the case early next year. State Assembly Speaker Carl Heastie is proposing new income tax brackets on New York’s wealthiest, with a top tax rate of over 10 percent on those making more than $100 million a year.